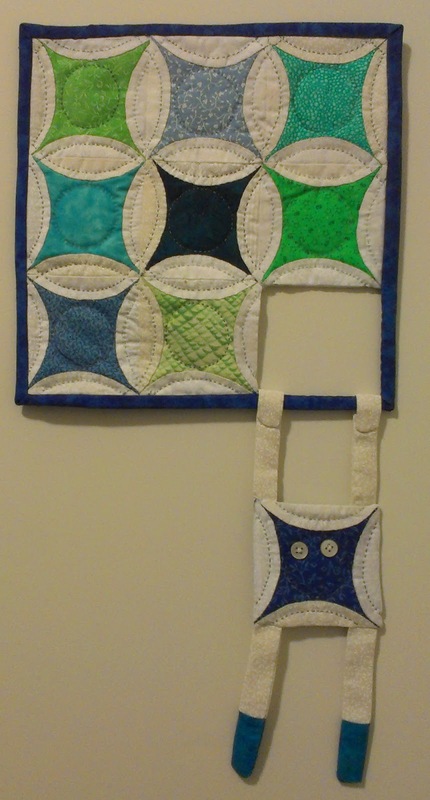 Any of these wall hangings can be reproduced in other colours if desired. 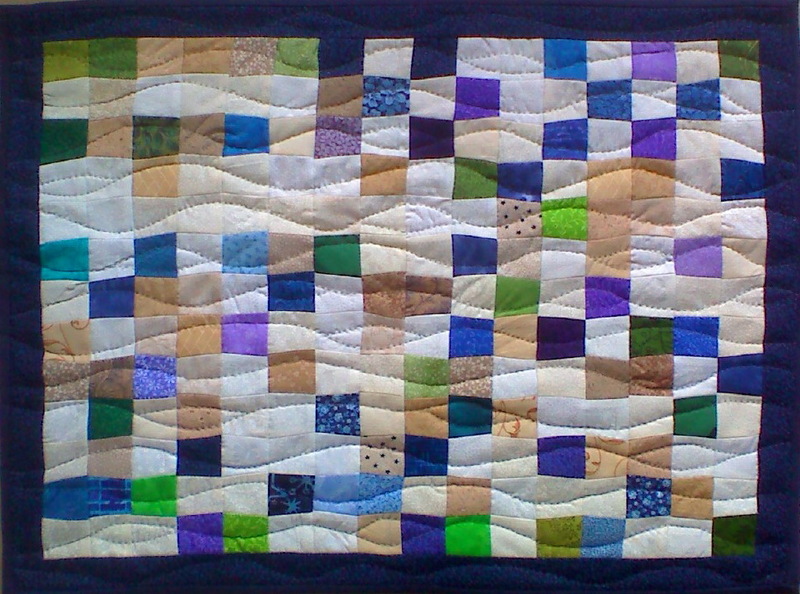 Just email with the name of the quilt in the subject line and let me know what you want. 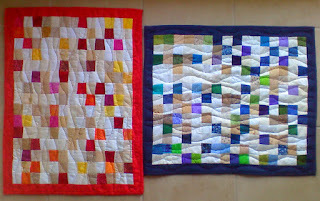 Each has a sleeve attached across the top of the back for hanging. 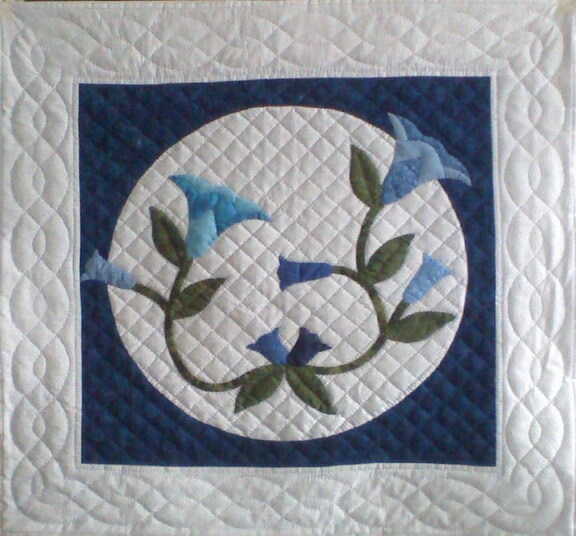 I do some piecing by machine, but all appliqué and quilting is done by hand. Most of the wall hangings shown are in stock and for sale. Email for pricing and more information. It Is Well With My Soul is 18" x 33". It is yet another of my "inspirational quotes" series that is expanding as we speak. 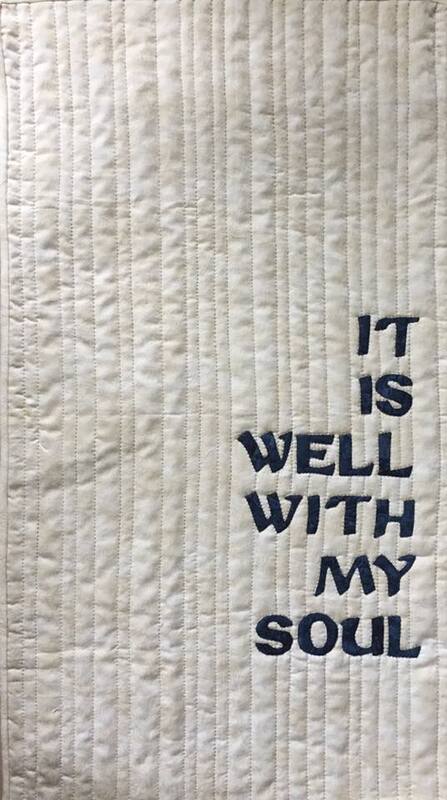 The background is a mottled beige print with a navy blue tone on tone for the letters. 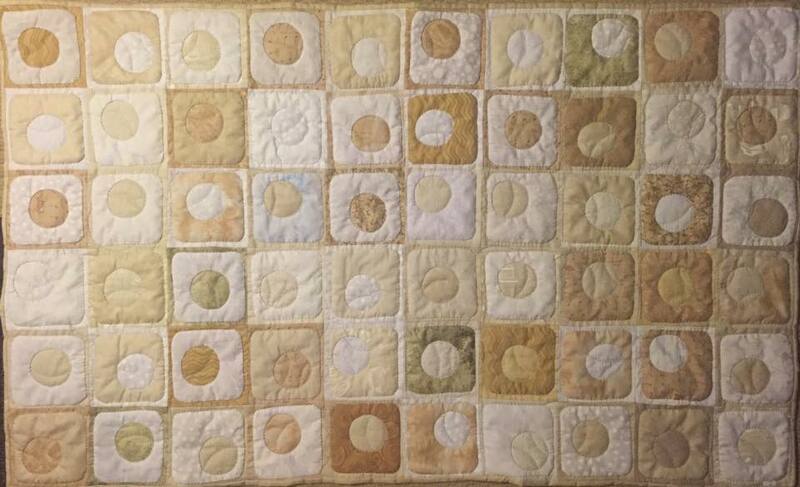 I used variegated beige/tan thread to quilt the random width vertical lines. 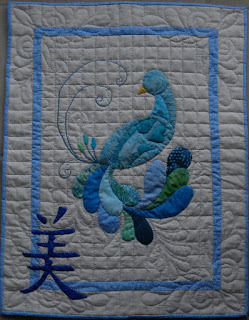 In Chinese tradition circles represent a unity between heaven and earth. Also, red is considered a lucky colour. 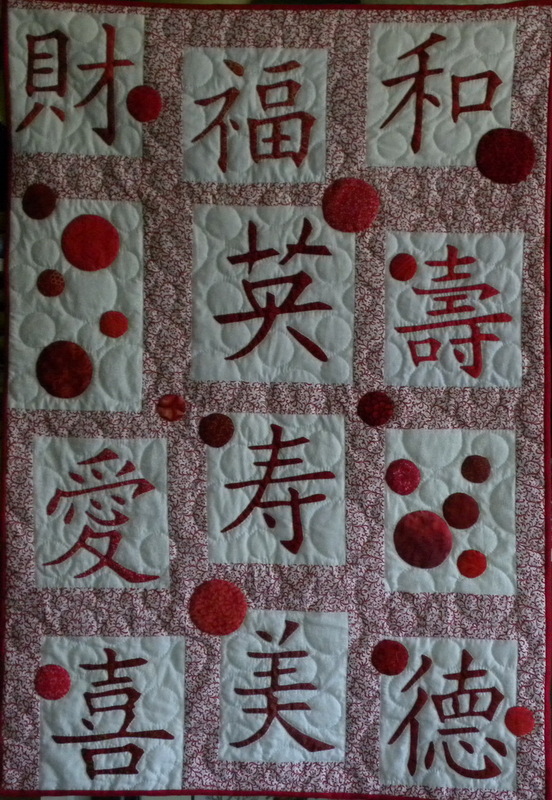 To hang blessings near your front door is believed to welcome good fortune to your home. Blend-in Boy is 16" x 24". It was inspired by my daughter. When she was about 5 she had a friend over and didn't want her little brother playing with them. When I insisted she told him, "Ok, we're going to play superheroes, you can be Blend-in Boy ... as in go stand by that wall and blend in". Gotta admire her creativity! 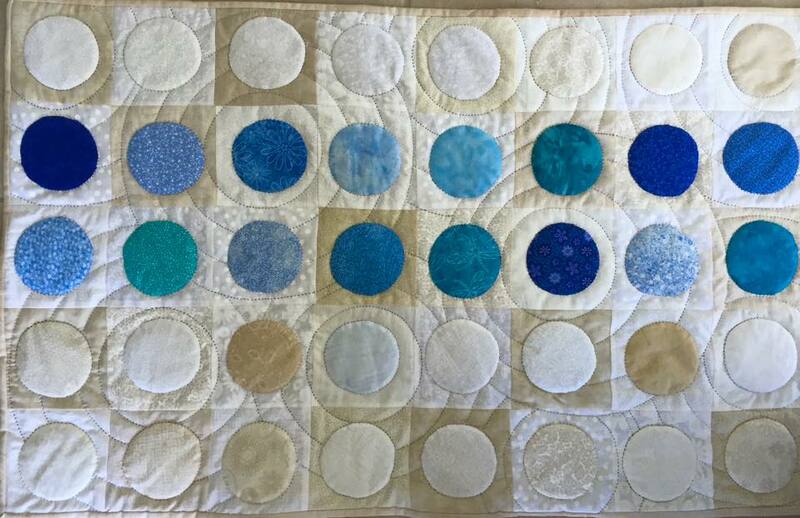 Each circle is appliquéd onto a background of a similar colour so that they blend in well. 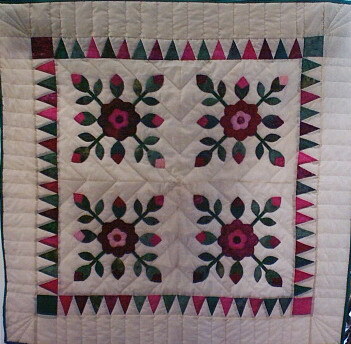 Blossoms & Buds is 35" square in various pinks and greens on muslin. Blue Lilies is 24" square. Blue Checkerboard is 36" x 36". It is adapted from the "Plaid Patches" pattern in the book "Fast, Fun & Fabulous Quilts". 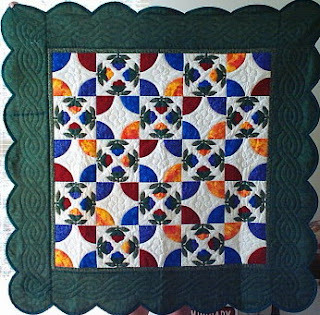 Chillin' With The Pineapples is 42" x 36" and is thus named because it is a. in cool "chillin" colours and b. it is made using the traditional Pineapple block. 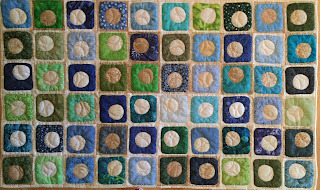 This quilt was shown in the Vancouver Quilters' Guild's 2015 Quilt Show. 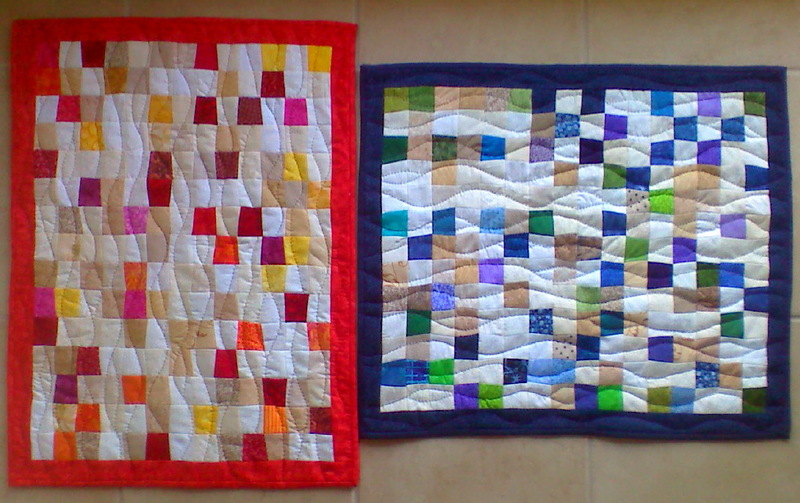 Warm Me Up and Cool Me Down are a pair of small quilts, each 18" x 22" made using a single block, a 1½" isosceles trapezoid. 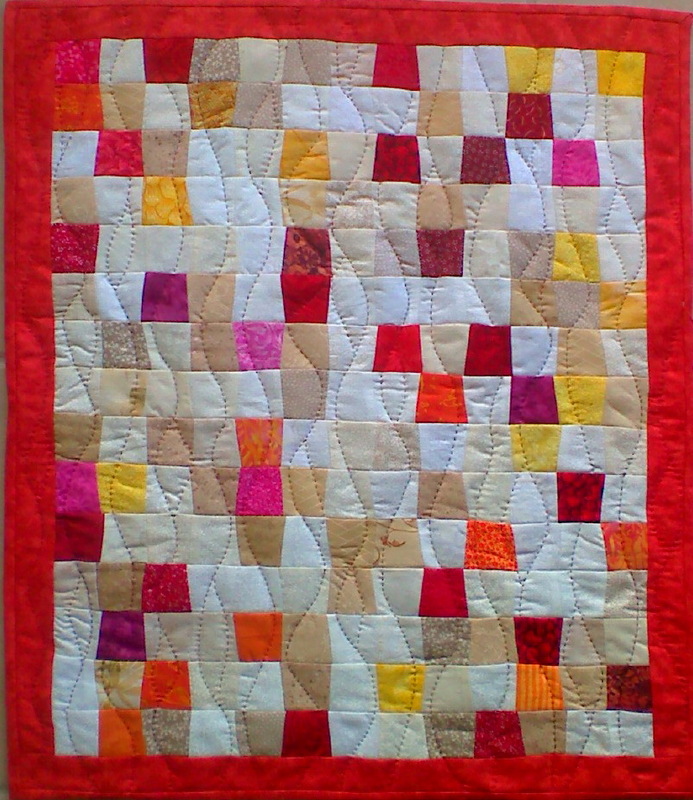 Warm Me Up is done in all warm colours with random neutrals, hung vertically with wavy lines quilted to emulate heat. Cool Me Down is done exactly the same way but with cool colours and hung horizontally to emulate waves. 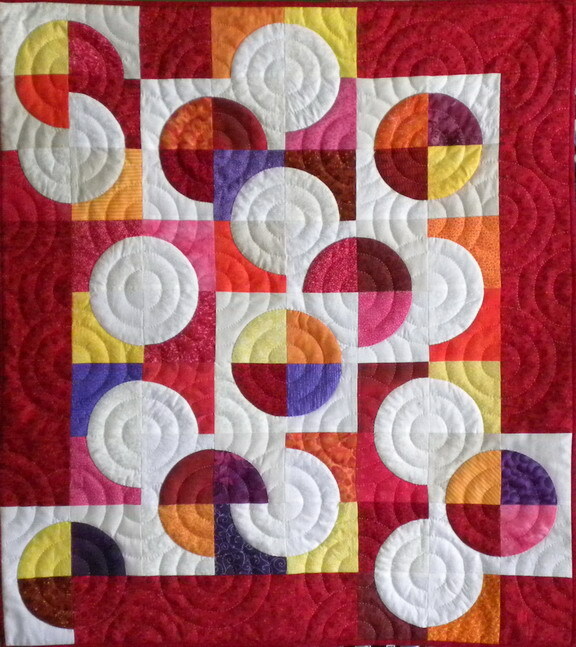 Squircles & Circles is 39" x 24". 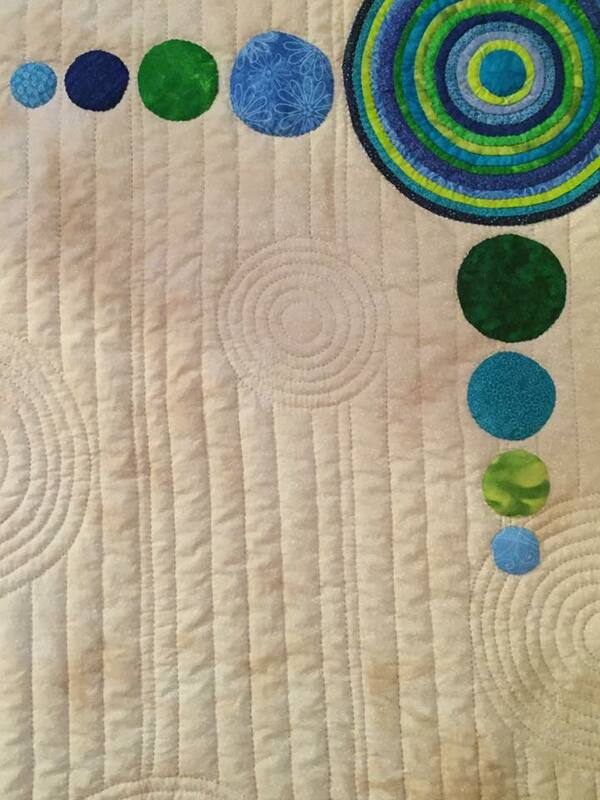 This quilt has squircles with circles randomly cut out inside them then appliquéd to a 4" background. Dot ... Dot ... Dot is 32" x 20". 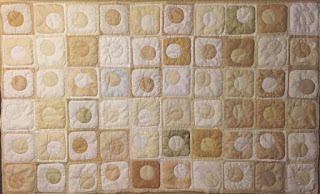 Just neutral 4" squares with circles. Vertical Dot ... Dot ... 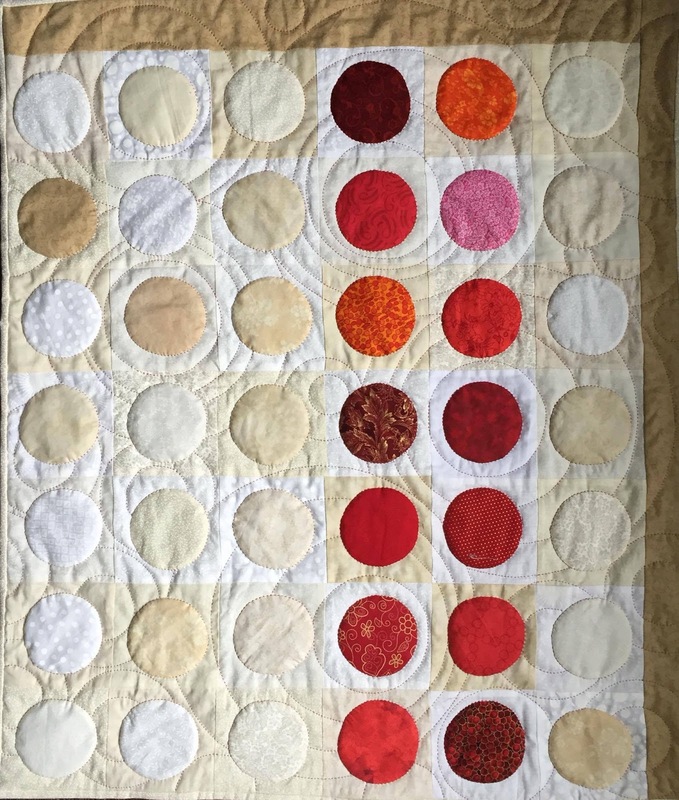 Dot is 25½" x 30". 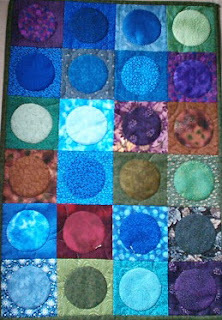 The same principle as above but a little bigger and with reds. Emergence is 40" x 44". 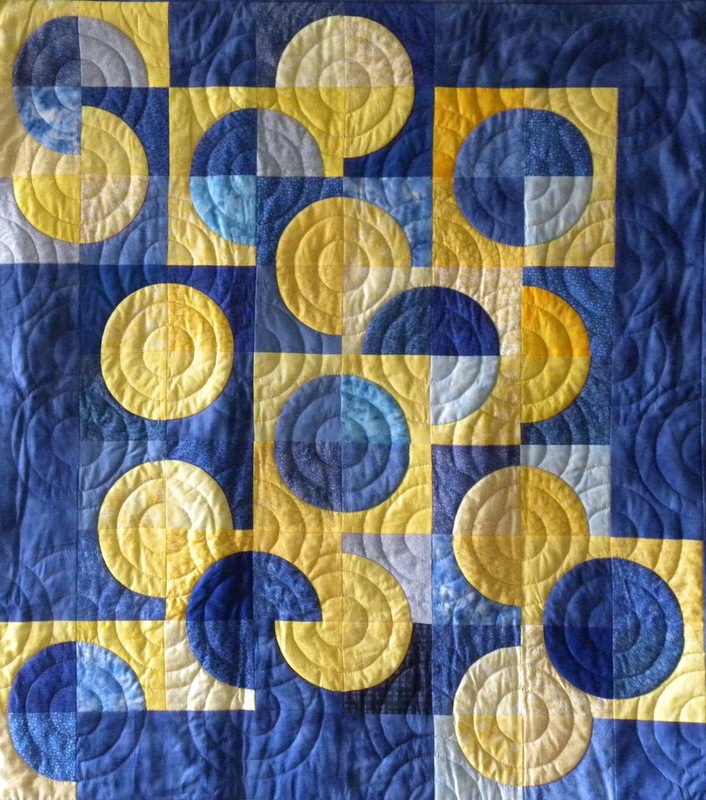 It is made up of traditional Drunkards Path blocks with blue on yellow and yellow on blue. Concentric circles are quilted in each block and the background. I've done this pattern in warm colours (below), neutrals, and blue & tans ... it always turns out great. Fangle Dangle is 9" square plus the little dangley guy. Just a fun little thing to hang in a small space. 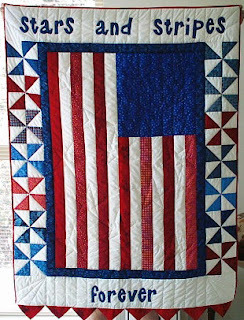 Stars and Stripes Forever is 42" x 57". It is laid out like the American Flag, with a blue starry print in the corner and alternating stripes of red and white. 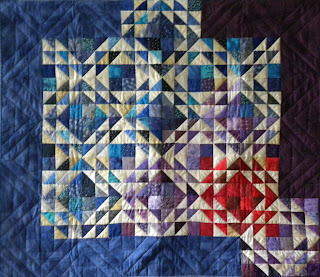 Blue and red pinwheel blocks adorn each side and prairie points line up along the bottom. 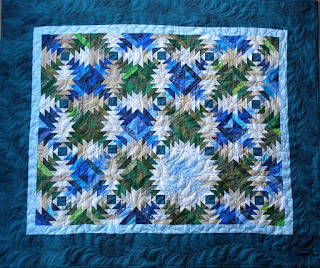 This quilt was made entirely by hand. Hou Leng means Beautiful in Cantonese. The peacock is well known as a symbol of pride and beauty so this is done with the character for "beautiful" in the corner. 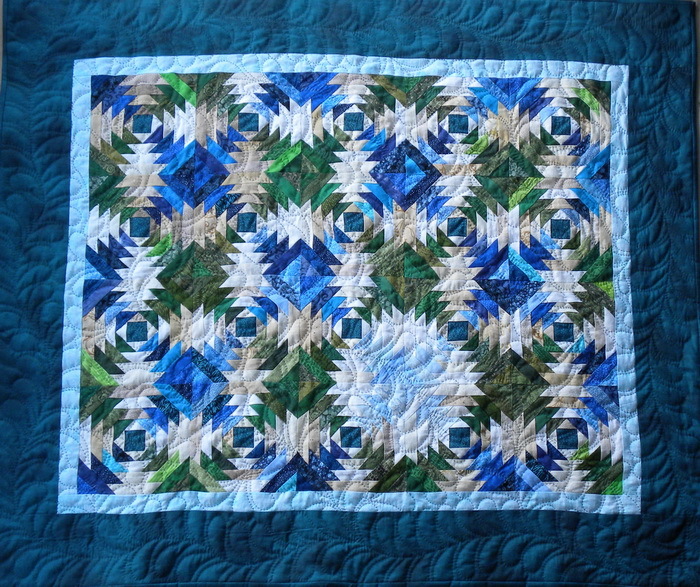 The quilt is 18½" x 24". 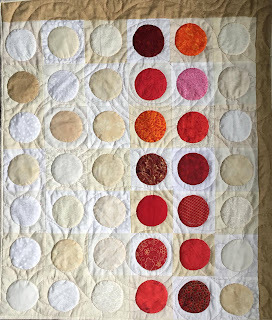 It Started Out Red is 46" x 41" is named this because basically, it did. 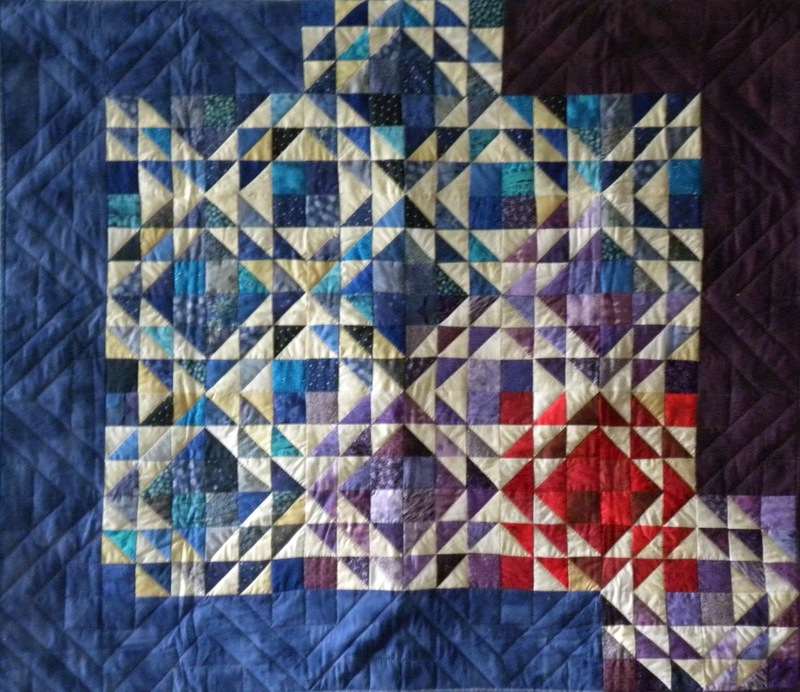 I started this quilt with the intent of making a red quilt, but I barely got through the first block when I got bored of red and decided to merge it into purple and then my favourite, blue. 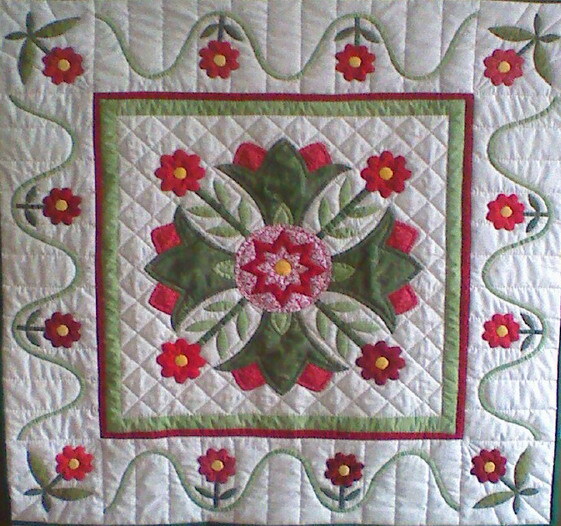 Jewel Garden is 50" square. It is made up of bright primary colours on a light background and a scalloped dark green border. 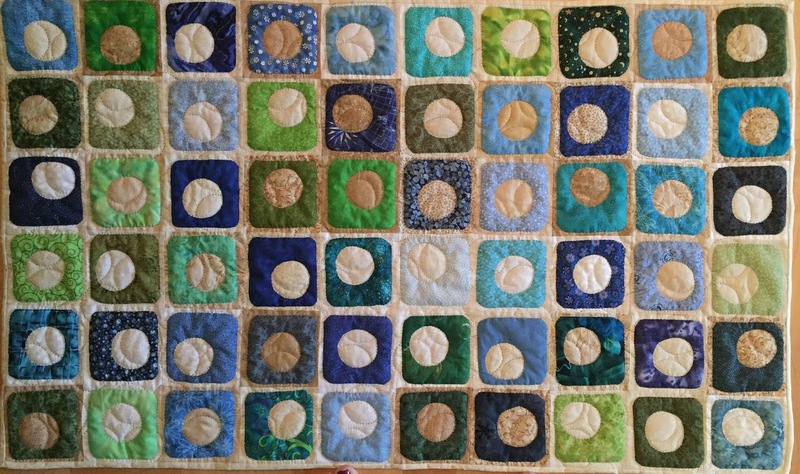 This quilt is made entirely by hand. 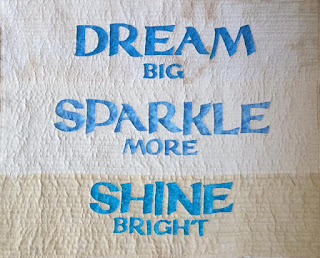 Live, Love, Laugh is 10½ x 29". 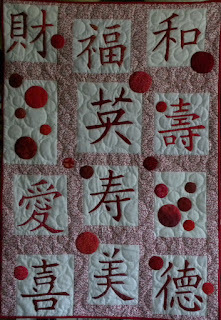 It has the Cantonese characters and the English words together in red prints on a muslin background. I'm Still Standing is 25" x 35". It's just a funky looking tree with one single leaf showing, and it's holding on for dear life. The other leaves are there, in the background, waiting to come out when they're ready. This is my self-portrait, symbolizing my struggle with PTSD as a survivor of domestic violence. Oh! You See Me! 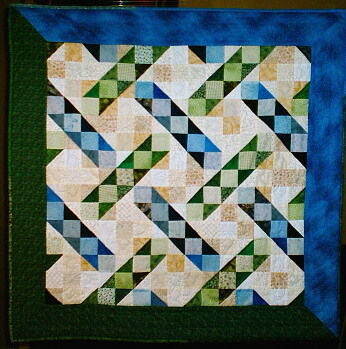 is 37" square. 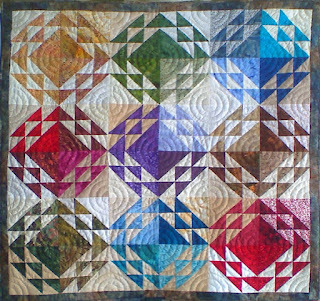 It is based on the traditional Ornery Husband, Contrary Wife blocks. I swapped out Husband and Wife for You and Me, then changed Ornery to O and Contrary to C. That lays out as O You C Me, which then turns into Oh! You See Me! 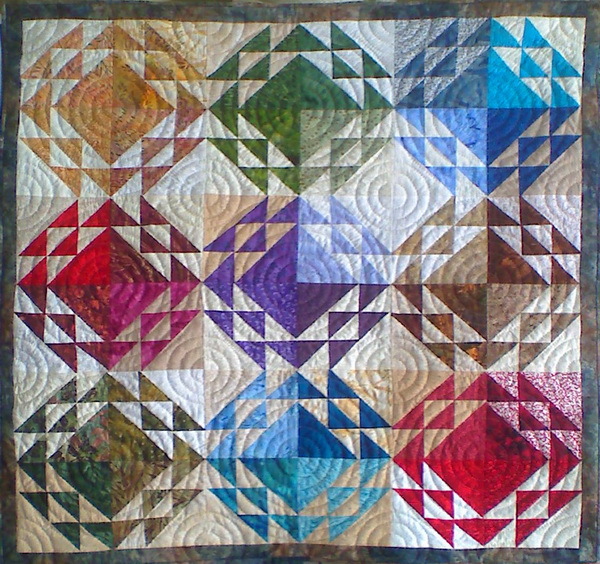 Shimmer is 37" square. It is mostly batiks. 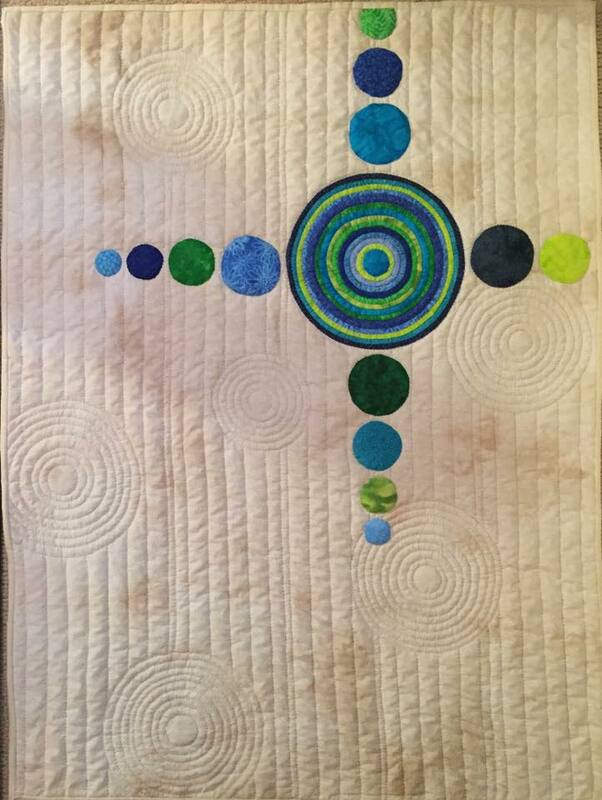 It is based on the traditional Corn & Beans pattern with concentric circles quilted throughout. 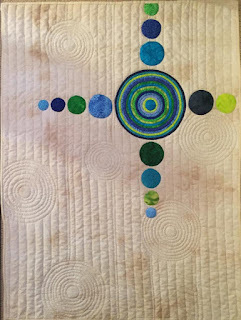 This quilt was shown in the Vancouver Quilters' Guild's 2015 Quilt Show. 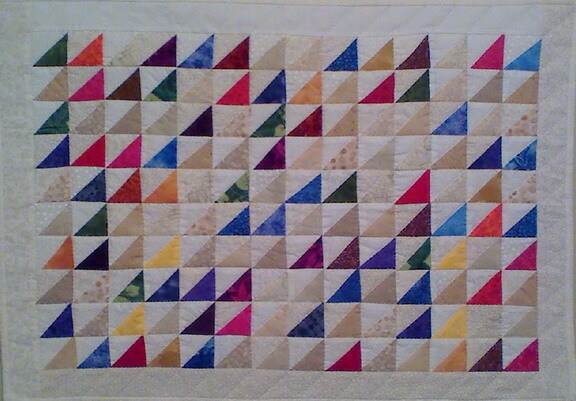 When I finished this I thought, ok ... what to name it ... to me it just looks like ummmm, coloured triangles. So it's named Ummm ... Coloured Triangles. It is 26" x 20". 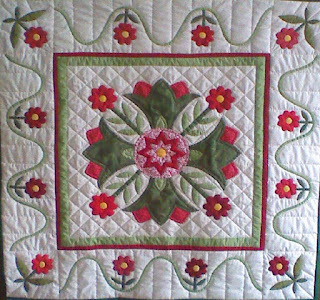 Christmas Whig Rose is 33" square. 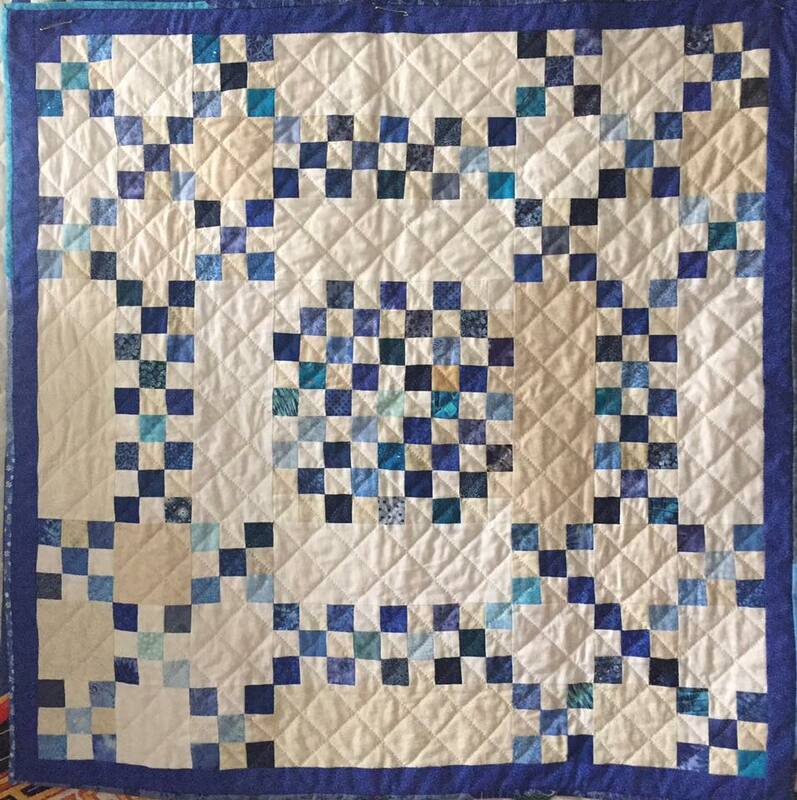 I got the pattern from a magazine, I'm not sure which one. 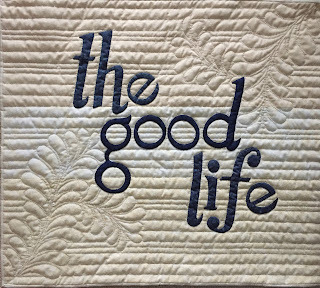 The Good Life is 30" x 26". 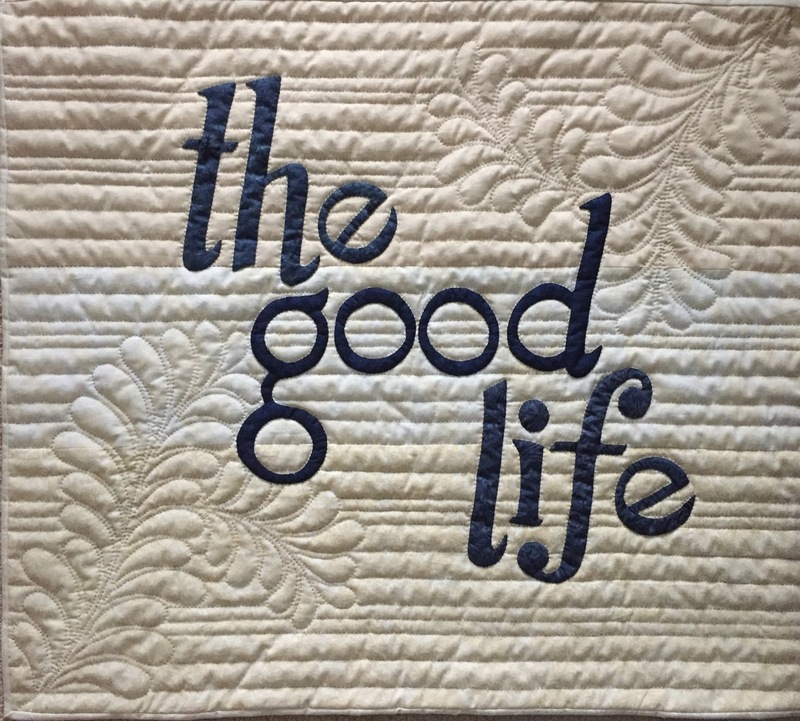 I had seen a piece of wall art on a tv reno show that had these words in big metal letters hung on the wall, and decided to come up with my own rendition. And..... is 20" x 26". Need I say more? 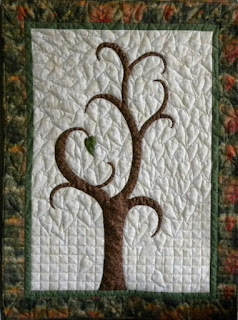 4 Trees is 49" x 14½". 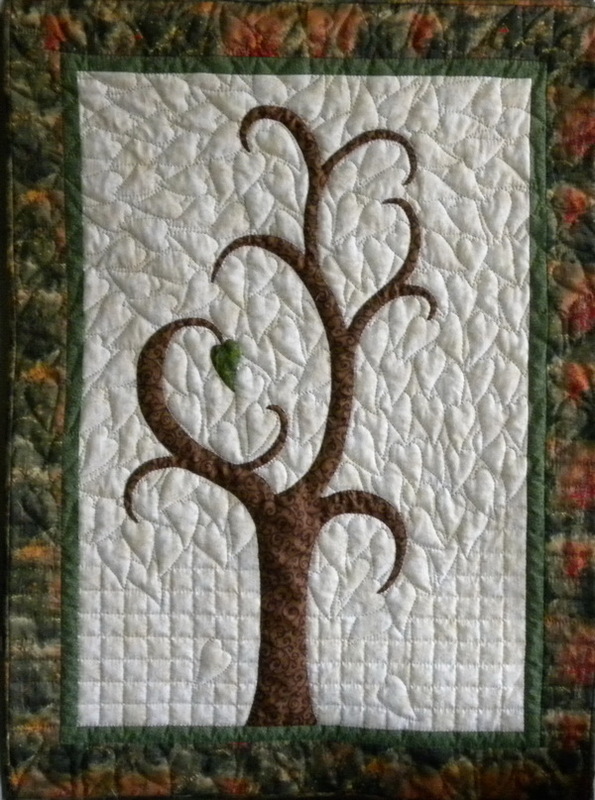 It has 4 identical trees hand appliquéd to different white on whie backgrounds. 3 Apples is 36" x 16". I made the apples all in one piece, chopped them up and put them back together with a skinny divider strip between each piece. 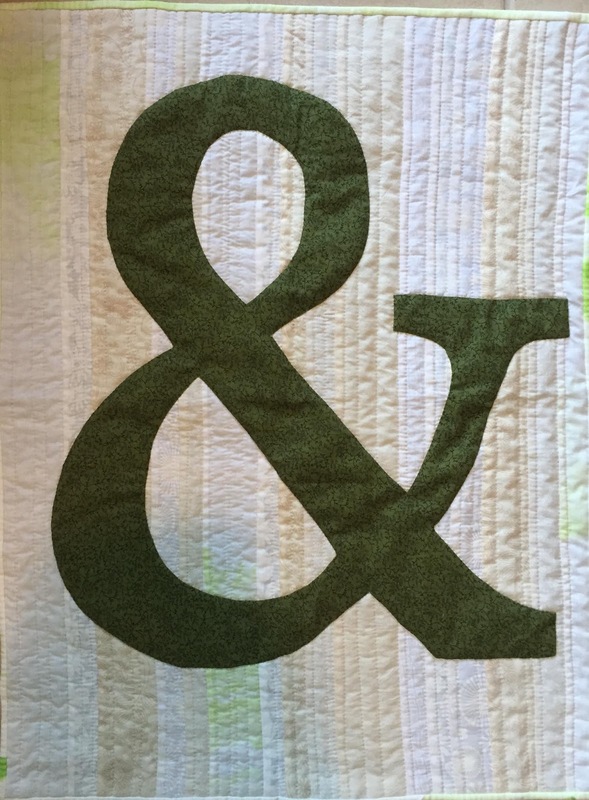 I know, the names for my quilts leave much to be desired, but hey, I calls 'em like I sees 'em. Concentric is 28½" x 38". It's based on the idea of crop circles with the main one and it's little satellites in blues and greens, then other concentric circles quilted into the background. 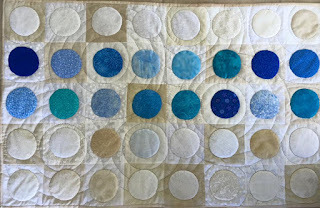 I tea dyed the background fabric for this one and quite like the result. 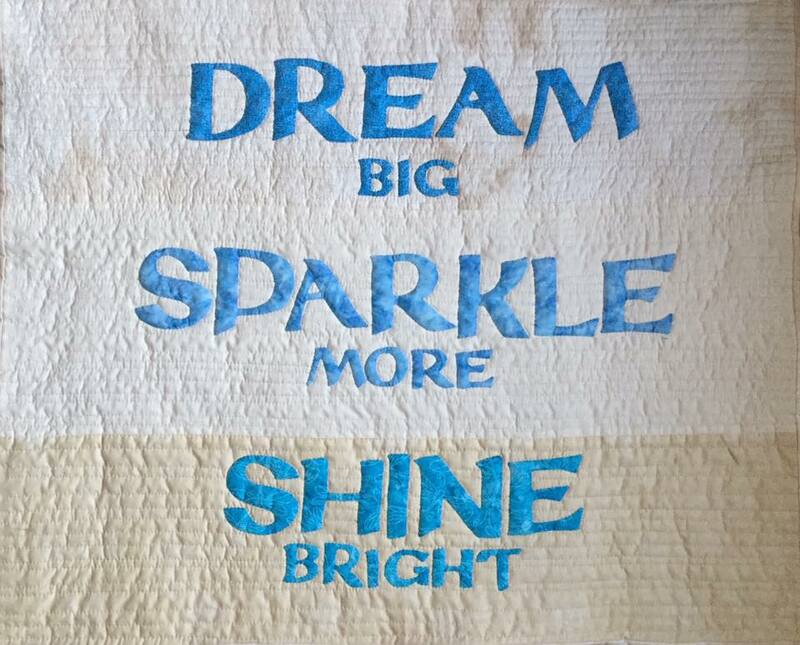 Dream, Sparkle, Shine is 33" x 27".